York Racecourse has a proud tradition of staging the very best of thoroughbred racing dating back to 1731 and is committed to investing in prize money and facilities to attract the top racehorses from Britain, Europe and around the world. We very much look forward to welcoming you to the Knavesmire. The guide is produced for Owners and Trainers which contains important information to assist in planning a visit to York Racecourse during the season. The Guide for Horsemen is available here. The International Races Brochure is available here. The latest going is updated on the homepage of this website. - Following our York Clerking Team, @YorkClerk on Twitter. - Calling 01904 683932 or on the 24 hour telephone information system by calling 01904 620911 and following the instructions. Owners and trainers wishing to speak to Anthea Morshead, Racing Manager and Raceday Clerk of the Course, please call 07837 559861. The Owners & Trainers entrance is adjacent to the dedicated Owners & Trainers car park, near the Weighing Room. complimentary Owners Badges for the raceday for use by you, your family or close personal friends. Extra Badges may be purchased at a discounted rate, subject to availability. Please bring your PASS swipe card to obtain your Owners’ badges. Rachel Blizzard, Owners & Trainers Manager, is available to assist with any queries, from 10am on raceday mornings, by email, telephone 01904 709246 or fax 01904 706127. 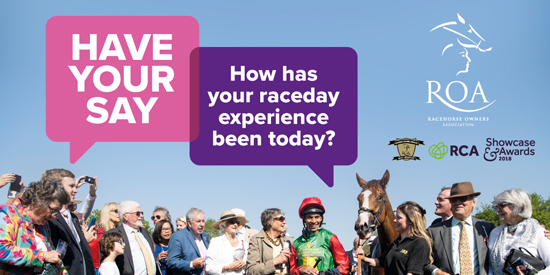 Ahead of a raceday, Jane Richardson can be of assistance by email or telephone 01904 683932. Trainers are entitled to two complimentary Owners & Trainers Badges, provided that they have declared runners on the day of racing. Reserved for the use of owners and trainers with a runner on the day, it is situated on the first floor of the Melrose Stand and close to both the Winning Post and the Parade Ring. This facility has a trackside lounge area overlooking the winning post and an adjoining dining area. review races run on the raceday and a complimentary tea and coffee station. Wheelchair access is via the Melrose Stand lift lobby. Dress Code: Gentlemen are required to wear a jacket, collar and tie (except Family Sunday in September when the dress code is relaxed). Lunch comprises of a starter, chef's carvery and dessert in the Restaurant, followed by tea or coffee in the lounge area. A single owner, partnership or syndicate with a runner(s) on the raceday will be entitled to a total of up to six complimentary lunches, irrespective of how many runners on the day. Places for lunch can only be guaranteed if booked by 5pm the day before racing and are allocated on a first-come, first-served basis. The registered trainer with runner(s) will be entitled to their own lunch, accompanied by a guest (a maximum of two complimentary lunches per trainer, irrespective of how many runners). In the Owners & Trainers Club tables may be shared, however should you wish to have a reserved table for the whole day, various Restaurants and Private Box facilities can be reserved, subject to availability at a special rate by contacting Annette Wilks on email or 01904 638971. There may be late availability on a viewing box, if this is of interest, please contact, Nick Johnson by email or 01904 683933. York Racecourse lies within a mile south of the city centre and is served by convenient road, rail and air access routes. Within a mile of the A1036 York (West) exit of the A64 (Postcode YO23 1EX). Dedicated Owners & Trainers car park is at the front of Car Park A and is signposted. Your ROA car park label, the Guide for Horsemen or 5 day entry email/letter from Weatherbys acts as a car park pass. Direct trains from London Kings Cross (1 hr 50 min), Edinburgh (2 hr 27 min), Manchester (1 hr 15 min) and Leeds (23 min). The train station is a taxi, regular shuttle bus or a 20-minute walk to the racecourse. Leeds/Bradford International Airport (40 min) and Manchester International Airport (90 mins). Light aircraft can be accommodated at Rufforth, only 6 miles from the course and can be arranged by calling Helicopter & Aviation Services Ltd on 01427 718800. All these hotels are situated within a short taxi ride or walking distance of the racecourse. Enjoy a short break in the White Rose county, discover more with Visit York. The vehicle entrance to the York Racecourse stables is on Tadcaster Road (A1036), opposite the Fox & Roman public house (satnav code YO24 1RQ). To book stables and accommodation for stable staff please email stables@yorkracecourse.co.uk or fax 01904 778647 or telephone 01904 709174. The overnight stabling and accommodation booking form can be found here. We have three specialised equine vets on site during every raceday to attend to any horses that may require treatment, with Minster Equine Veterinary clinic only a short distance away if needed. For the Dante and Ebor Festivals, veterinary cover is enhanced by the Equisave Horse Ambulance, designed and used for the equine events at the London Olympics, in addition to the Horse Ambulance team provided by Sebastian Garner. Minster Equine Veterinary Practice can be contacted on 01904 788840, or email poppleton@minstervets.co.uk. Our dedicated photographer, Jeremy Phillips, maintains a website of images from the racecourse, click here to view. William Derby (Clerk of the Course) and Anthea Morshead (Racing Manager and Raceday Clerk of the Course) will be on hand in the Parade Ring throughout the race meeting and will be pleased to help you with any requests that you may have. We are always happy to try and help with any special requests. Please contact us in advance if possible. Tel 01904 683932 or e-mail jane.richardson@yorkracecourse.co.uk. Sarah Holton is the point of contact at the ROA, email: sholton@roa.co.uk. Please feel welcome to pass on any comments/suggestions to her with regard to the facilities for Owners at York. She will be pleased to help and will liaise with the Chief Executive, William Derby.